Have passion for your new character: So, being an English Longbowman has grown stale. You love the culture and motif, but you’re willing to try something new. Great! Look up the histories of the many medieval civilizations. Which ones pique your interest first or the most? Who knows, you might be wearing a Monk’s robe this year! Choose your weapon: Tired of touting your trusty tomahawk? Maybe you’ll prefer the piercing power of a pike! The weapon you carry can make a huge impact on you and your character. Choosing a new weapon can breathe new life into any costume. Mind the Weather: For years, you’ve been a knight in the rootin’ Teuton army. Your armor is thick and heavy and your favorite faire is in Georgia in June. Not only that, one of your LARPing guilds’ biggest battles is in the beginning of August. Needless to say, dehydration is a huge factor when prepping for these events. Why not mix it up a bit? 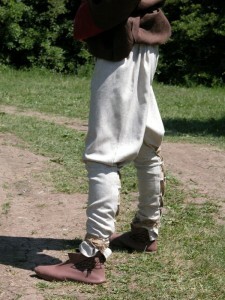 There is plenty of light and breathable medieval clothing that is much more comfortable in the summer months. Don’t be afraid to take it for a spin! What tips do you have for those thinking of trying on a new character this spring or summer? Any specific recommendations you’ve tried your own hand at, or been impressed by when you’ve seen others? Please share in the comments!